Gurudev made a Sankalpa 50 years ago to build his Kutir on this sacred land where he did most of his spiritual practices. Mani Dweep has given an oppurtunity to many trades persons right from the brick layers to the painters and gardeners to show their devotion to their GURU. I would like to share one of my experiences about the way people worked for their GURU, if they came with devotion or to make money. Those who worked sincerely are still working till today and those who came to cheat have never come again to MANI DWEEP. Gurudev spoke about Mani Dweep, a sacred land on top of the hill where the rays of the sun would come right the rooms of his Kutir. This land is in Paramhamsi Ganga Ashram just above Sidheshwar Temple. It is the most divine piece of land and working on this site for 6 and half months has been the most memorable moments in my life. We were in Barnala Punjab on December 27th 2005, when Gurudev gave us the instruction to build his kutir on Mani Dweep. He said he wanted a bedroom, pooja room, library, and a sitting room where he could meet his disciples. He also said he wanted a place which was quiet and where he could have his privacy for reading. When I saw the site that Gurudev had in mind I could not figure out anything as it was covered with thorny bushes. We contacted our architect Mr Chandra Hasan who had also designed the house we live in, to work on the design of Mani Dweep. The final drawings were sent to Gurudev in the month of January 2007 for his approval. He asked us to go ahead with the Bhoomi Pooja. Work started and never stopped until October 12th. Mani Dweep being the Sankalpa of a realised Saint, every brick and cement bag was blessed as it is not possible to build 20,000 square feet in such a short time. The energy that exists in this area is so divine that after non stop work for seven months no one fell sick. The labour who worked on the site were from five neighbouring villages. Almost 150 people got work continuously for the entire period of time the Kutir was built. Rama Gurudev’s baby elephant loved to visit Mani Dweep every week and she was pampered with fruits and coconuts. Guruji’s sankalpa did the entire construction, I was only a Mani Dweep witness and witnessed this immense power right through the entire period of time, from February 27th to October 23rd. Michelangelo the renowned painter, sculptor once said “I do not do anything, I only uncover the painting” Mani Dweep too always existed but it was Guruji’s Sankalpa which manifested it and thus he gave all his shishyas the joy of coming and visiting him in his own Kutir. Guruji knew exactly when his Sankalpa would be completed and on October 12th he inaugurated his palace. There were times when I used to wonder when Mani Dweep would be complete and go everyday to Maa Bhagvati’s temple to ask her for Shakti and make Gurudev’s Kutir so beautiful that he would be happy living in it as Mani Dweep is the residence of Maa Bhagvati just as Saket Dham is the residence of Lord Shri Ram. We met Gurudev in the year 2004 for the first time and our life just changed, life became worth living and everyday there was something worth to look forward to. His presence itself was enough to energise me, and when I met him every evening during the months of May and June and told him all that was done during the day at Mani Dweep. Gurudev always had a SMILE and listened to every word I said though he knew it all, I used to think how humble he is although he is a “Jagadguru”. Every moment he made me feel so special that I just wanted to do more and more, knowing very well in my heart that it was all his doing. A Guru knows the mind and heart of the disciple even from the distance. There are many means of communication between the Guru and his disciples. A look might replace speech or talk, and in the distance a Guru can join his disciple through thought, or prayer. On October 12th when he completed the Maha Pooja of the first day of Navaratri, I presented him with the keys Of Mani Dweep on a Silver Plate with a red ribbon tied around it. Gurudev asked me “What is it?” and I said Gurudev it is your own Kutir keys. Gurudev has given us so much that the seven months I spent in Paramhamsi was just a drop in the ocean. One week before Gurudev inaugurated Mani Dweep the Tulsi plant almost withered as some kind of an insect got into it. I went and removed the insect with a stick. On October 12th I was amazed to see “Maa Tulsi” in absolutely full bloom and the entire plant grew big with bright new leaves, Gurudev’s presence in the kutir made the entire garden alive and every plant was in full bloom, it looked as if “MOTHER NATURE” was present there to welcome the LORD herself. Every morning Gurudev would go out and sit in his garden basking in the sun after his massage, I used to watch him read his paper and remembered the day he spoke to us of his kutir in 2005. He had visualised what was coming and Mani Dweep was BORN. It was waiting to be unveiled for all of us to see Gurudev’s divine Palace. Every person who worked and the suppliers, manifested from time to time as and when they were needed. The entire labour was from the five surrounding villages and they had never done such work before, but it was only the blessings of Gurudev that gave the energy for them to work. The carpenter who carved Lord Ganesha on the bed head of Gurudev could only work in the night, he was so motivated that lack of sleep did not affect his work, the bed turned out to be a masterpiece. Swami Avimukteshwarananda came after Chaturmaas on September 27th to see the progress. He came and saw that there was a lot of work pending and expressed his concern as to how GURUDEV, would celebrate the nine days of Navaratri pooja in Manidweep. This was the turning point as I knew that it is Guruji’s sankalpa and it had to be completed. From September 28th to October 11th, all worked day and night and 13 days later “MANI DWEEP” was ready to be inaugurated. Another miracle of GURUDEV. Every stage of the construction I witnessed a miracle and when at a stage there was shortage of money I became nervous and concerned, but Guruji took care to see work did not stop even a single day and there was enough money. Mani Dweep was born on October 12th as Gurudev had to complete his Sankalpa and we followed his instructions. 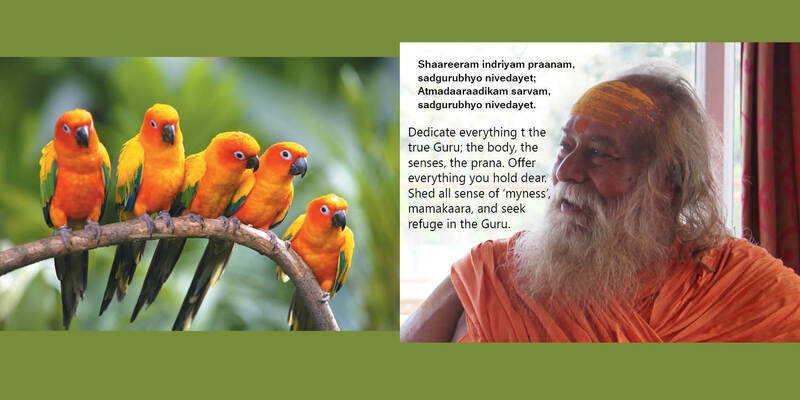 Guruji gives an opportunity to all his shishyas to serve him, as a way to resolve their ‘karma’. It is up to them to receive it. Once Gurudev said “sitting and massaging my feet is not doing service to me”. Service is following the GURU’s instructions and in doing so you surrender to him 100%, which leads to the path of Salvation. Obstacles came at every stage from the beginning to the end. Obstacles are a part of nature and will arise no matter what. At one stage I spoke to him about obstacles in the human form, he smiled and made it clear that though they do exist, they should not deter us from our focus because they are immaterial. My dear brothers and sisters, I would like each and every one of you to visit this divine place and experience the positive energy and ultimate BLISS that emerges in Mani Dweep. After a span of 50 years Pujya Gurudev’s Sankalpa was fulfilled.